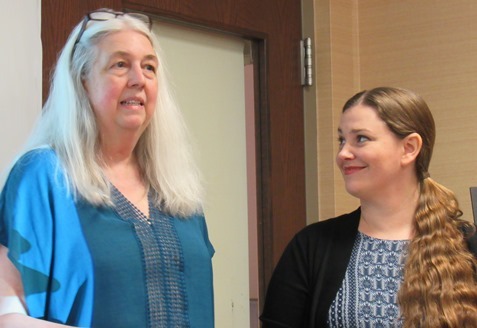 Southwest Boulevard Family Health Care launches $4.2 million drive for expanded facilities for the needy – Welcome to Wyandotte Daily! With health clinic facilities “bursting at the seams,” today Dr. Sharon Lee announced a $4.2 million capital campaign for Southwest Boulevard Family Health Care, 340 Southwest Blvd., Kansas City, Kansas. The health care, dental and mental health care services at the nonprofit clinics will serve families in need. Dr. Erica Findley, dental director at the clinic, will lead the capital campaign. First, the dental clinic at the Southwest Boulevard location will be modernized, Dr. Findley said. Second, a dental clinic will be opened at the Quindaro clinic at 638 Quindaro Blvd., she said. “We will also be opening our doors to serving the dental needs of children in the community,” she said. A new dentist for the clinic was recently hired, she added. Mental health clinics at both locations will be expanded, she said. By having a dedicated space for mental health services, the clinic will be able to collaborate with other organizations in the community, she said. Besides hiring another therapist, Southwest Boulevard Family Health Care plans to contract with Wyandot Inc. for mental health services. In addition, the clinic has agreements with the University of Kansas Family Medicine that will provide increased services. Dr. Findley also said a new parking facility is part of the renovations. Dr. Lee hopes to have the renovation projects completed by the end of 2019. Working with the capital project are Courtney Kounkel and Eric Turner of Monarch Build – Contractors; and Neil Sommers, architect. Kounkel and Sommers also worked on the clinic’s first expansion and 2012 expansion. Currently, the clinic may see around 4,000 patients a year, and there was an estimated 5,000 last year, according to officials. The center may hit the 8,000 mark for patients in two years, they estimate. The capital campaign will allow the clinics to provide more services to patients, such as more mental health services, and more access to services, Dr. Lee said. A few years ago, funding for mental health services was cut, she said. This funding will help bring back some of the therapist and other related positions that were lost then, with services for the needy. Some state funds are available for providing services, Dr. Lee said. In addition, the clinic is applying for tax credits through the state, but won’t know if they are available until August. In the past, the clinic was able to get tax credits, which are deductible on individual donors’ taxes. There are now three dentists and a hygienist at the clinic, with a need for more space, she said. The clinic is seeing six to 10 new patients every week, she said. There is a sliding scale for patients’ fees at the clinics. Patients who are 200 percent at or below the poverty guidelines may use the clinics’ services. Some patients would have no other place to go were it not for Southwest Boulevard Family Health Care, according to clinic officials. Thursday night, there will be a Tacos and Beer fundraiser to kick off the fundraising campaign at 6 p.m. at the Boulevard Brewery, 2501 Southwest Blvd., Kansas City, Missouri. 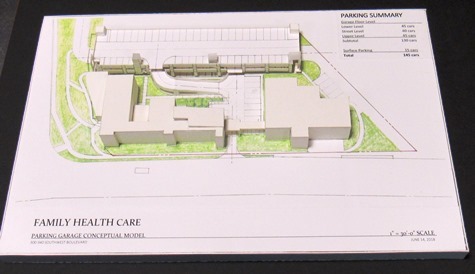 An architect’s drawing of the new parking garage proposed at Southwest Boulevard Family Health Care. 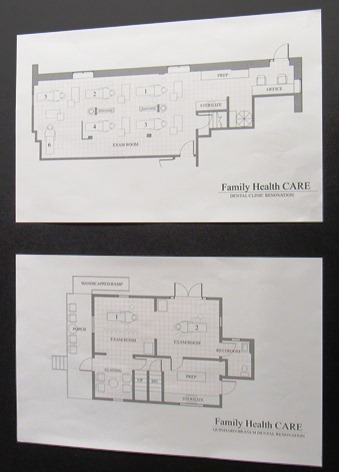 An architect’s drawing of the dental clinic expansions. 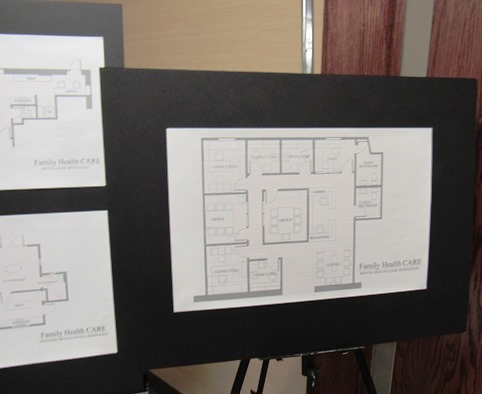 More expansion plans for the Family Health Care Clinic. 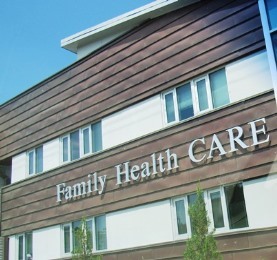 The Family Health Care Clinic is on Southwest Boulevard, with another location in Quindaro. Congratulations! What a statement of progress towards serving the underserved! Wishing you a well gifted campaign!